Bally presents its new collection of sandals in the summer line for the spring and summer 2012 in the wake of the fabulous collection of colorful dancers, even the sandals are proposed in shapes and colors to suit all tastes. Bally loves surprise by proposing variants of its models in different patterns, so it is not surprising to find in the collection of summer sandals with heels of varying heights in order to satisfy all fashion victims, and also see some creativity in the field of flat sandals, very valued in line. Let's find out what's new. The sandals of the line are very special orchid right from the form. They are made of textured leather calf, have open tip-toe, high heel and wide coated, covered heel and ankle strap White. The models are concluded to have leather soles and uppers of turquoise with white profiles, and the price the online store is 495 euros. The same form is also provided for the versions with different heel: we speak of the model with Olinda kitten heels, at a price of 395 euros, and shoes with heels Olara average of 450 euros. Crevas is a sandal lambskin with stiletto heel of 12 cm and 1 cm outer plateau, has open toe tip lists and twisted along the instep complemented by elastic slingback, brown leather band at the instep and gold inserts. The price is 495 euros. The sandals are shaped slippers Tinus lambskin with stiletto heel of 10 cm and the tip lists suede open toe adorned with gold ribbon and leather inserts. The model is provided in powder pink and the price is 495 euros. The Seashell are comfortable low-heeled sandals with 3-inch, available in kid leather with red paint effect. The lists are intertwined, and the model is also fitted with ankle strap to create a cage (395 euros). The collection also includes the wonderful line Polda flat sandals, leather heel 3 cm, paint effect, elastic inserts and contrasting applications open at the tip toe. 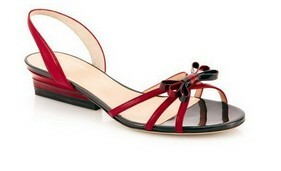 Lists have red and black with red ribbon, red leather slingback and the price is 375 euros. The Polda are also offered in other colors, while the slippers Syba exploit the effect of gloss paint.